At the American Museum of Natural History, every month an event, called SciCafe, is hosted where guests can come to the museum after hours, are served dinner and drinks (for a small fee) and are treated to an exciting lecture by one of the museum's staff about their research! It is a great way to spend a weekday night if you have the time. 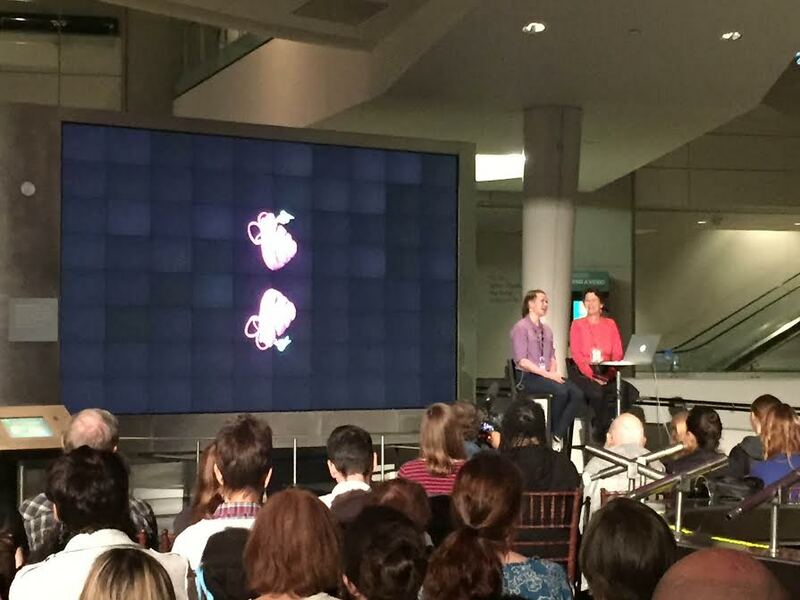 This past week I had the pleasure of attending one of these events where the topic of the night was bats. Curator of Mammalogy, Dr. Nancy Simmons, and Postdocotral Research Fellow, Dr. Abigail Curtis, shared their most recent research on the inner workings of the earth's only flying mammal. What made this lecture particularly interesting to me, and I'm sure a lot of people, is the fact that Dr. Simmons and Dr. Curtis, are using modern technology, like CT scanners, to find out new information about specimens of bats, here at the museum, that were collected over one hundred years ago. A dead bad, preserved in formaldehyde, can be scanned without leaving its jar, and yield a three-dimensional image of its insides. One specimen, in particular, turned out to have been collected on one of Theodore Roosevelt's expeditions! It's great to know that specimens in the museum are still proving their worth after so many years. Dr. Curtis and Dr. Simmons answering questions after their lecture. A CT scan of a pair of cochlia (part of the inner ear) of a bat floats around on the screen behind them. Dr. Curtis affectionately referred to cochlia of certain species of bat as "cinnamon bun-shaped" which made me hungry. 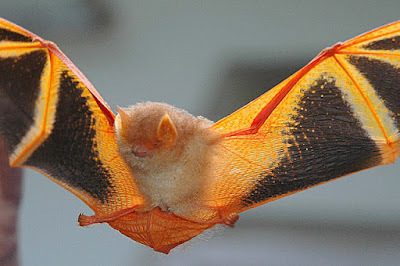 Bats are interesting because they are so specialized as a group, yet at the same time, were one of the first kinds of mammals to distinguish themselves after the great extinction that wiped out most of the dinosaurs. The oldest bat fossil ever discovered is about 52 million years old, so it was around not much longer after the Cretaceous ended, but still was a true, flying bat. So far, no transitional fossil between ancestral land mammal and a flying bat has ever been discovered. 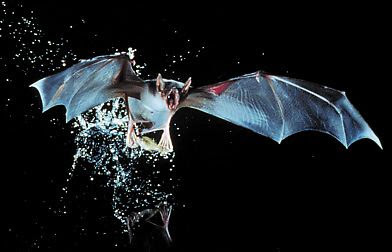 this means that the ancestors of bats must have evolving in the direction they were even closer to the Cretaceous. Since then, bats have had a LOT of time to radiate into the thousands of species that we see around us today. (Yes, thousands. 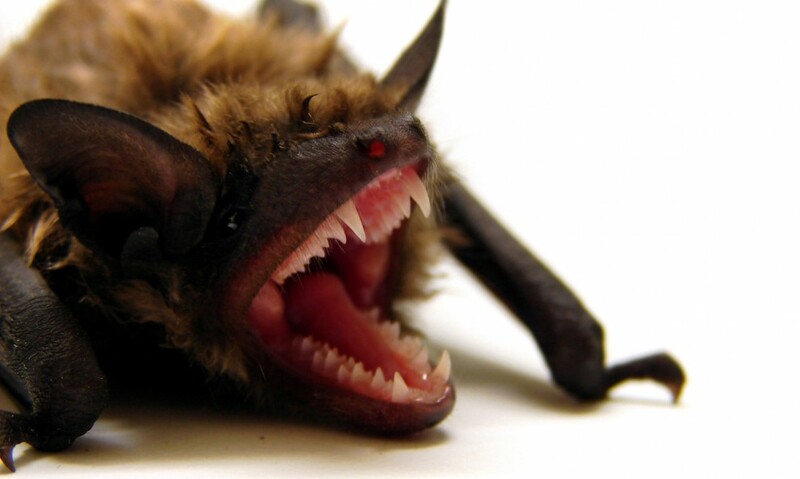 In fact, there are more known species of bat alive than any other major kind of mammal.) I learned from Dr. Curtis, that night, that within several hundred square feet of rainforest in some parts of Central and South America, there can be as many as one hundred different species of bat living there! That's a lot of specific niches. The Painted Bat (Kerivoula picta) which is native to Thailand, embraces the whole Halloween Stereotype it seems. Photo credit: Bob Cornes. This beautiful species was features briefly in the opening of the lecture. Small, differentiating features among different kinds of bats is what this lecture was mostly about. Thanks to new technology, we can now see features about a bat's skull (which can be about the size of your fingernail, depending on the species.) that we would never have noticed before. Minute variations in the structure of the nasal cavity, ear bones, and teeth of a bat can tell us a lot about how exactly they are living. My favorite species of bat is the Greater Bulldog Bat (Noctilio leporinus) because we share the same taste in seafood...or riverfood I suppose. These guys use echolocation to detect ripples made by fish on the water's surface, then crab them out of the water with their hooked claws. The minor differences in the shapes of a bat's nasal cavity, and inner ear, may drastically affect their sensort abilities, and therefore how and what they exploit as a food source. This could be part of the reason why there are so many different species, many times coexisting in the same habitat. One more really interesting fact I learned that night was that out of all the other major kinds of mammals alive today, according to DNA testing, bats are most closely related to...the order that includes pigs and goats, called artiodactyla. Not, insectivores, like shrews, and not even primates...pigs, goats, deer, cows, giraffes...those guys. Evolution never ceases to surprise me. For more information about SciCafe and this lecture click here!